The Volkswagen Touran is a well built seven Seater MPV that provides practical transport for the family. It is not the most modern design but it is well made and should stand up to some heavy use. There are three trim levels on the Touran. The S, SE and Sport. 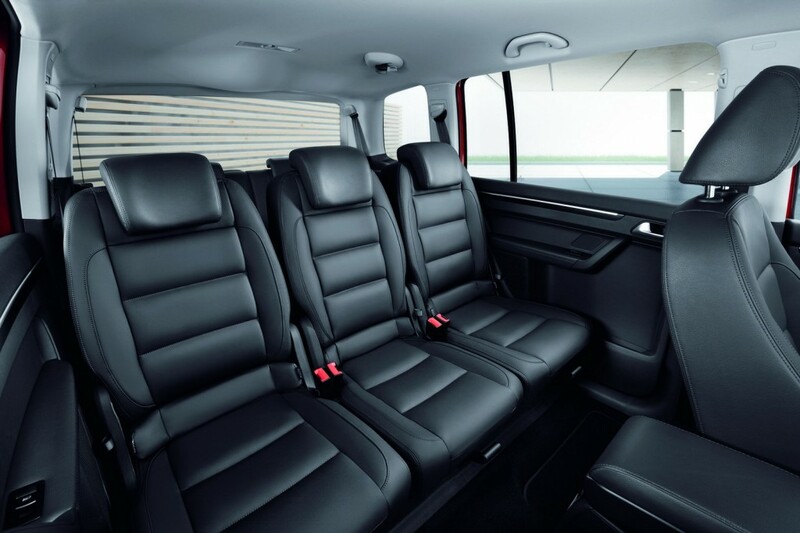 The Touran is a very practical seven seater car with lots of flexible seating arrangements thanks to three individual seats in the middle row which recline and slide to either give more legroom or more boot space. There is also plenty of legroom. And even in the boot seats there is a legroom and enough headroom for tall children though Adults will struggle for more than the shortest journey. And if you are using all seven seats be aware that you will only have room left for the smallest of bags in the boot as you only get 121 litres of boot space with all seats in use. Talking of the boot seats. Getting access to them could not be simpler. The middle row seats fold up cleverly to give easy access to the third row seats. 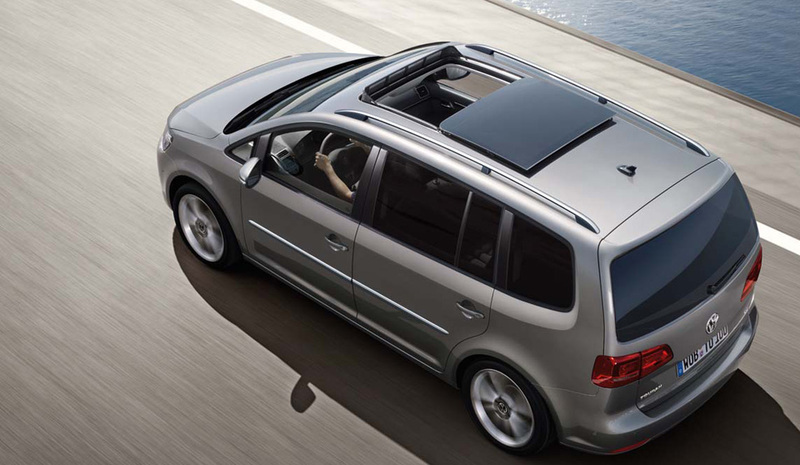 There is plenty of storage space as well in the Touran with 35 different storage locations dotted about the cabin. The problem with the Touran is when you need to fold down the middle seats. This car is very unusual for seven seater MPVs in that, although the boot seats fold flat to give you a great load space, the middle row seats DO NOT fold flat making it awkward for carrying larger items. The seats can be folded up but this leaves you with a gap and reduces the length and requires you to use bars to hold them in place. Alternatively you can remove the middle row seats completely but they are not light and obviously you need somewhere to put them which might not be practical if you’re at the shops and want to bring home that new dining room table you’ve just bought! The suspension set up in the Touran is quite firm but the ride is very comfortable. Whilst not the most spacious seven seater MPV it gives plenty of room for five passengers. It is relatively quiet in the cabin even when travelling at speed on the motorway. Although some of the diesel engines can be noisy and the shape of the Touran means that there is some wind noise at higher speeds. Sitting up high in the drivers seat you get excellent visibility with plenty of glass to see through. The cabin has the traditional Volkswagen quality feel to it though it does seem quite conservative compared to the more modern interiors of cars like the Ford S-Max. Driving the car is simple thanks to light steering and the relatively firm suspension in the Touran means that the car handles well around corners. 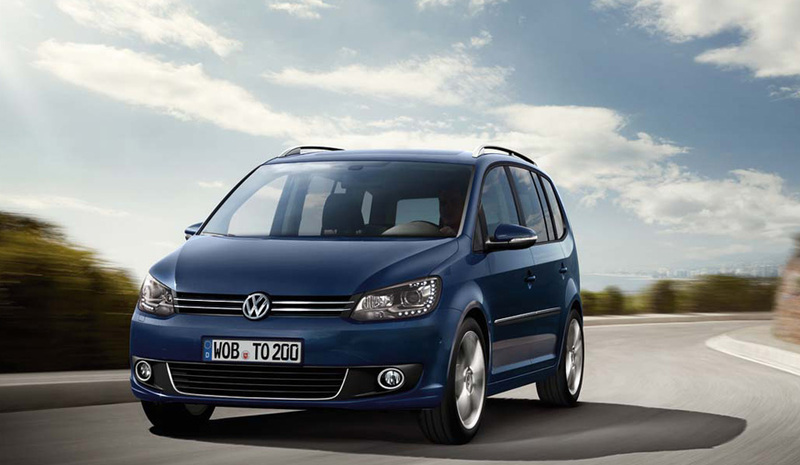 Cruise control, electric windows on all doors and air conditioning is standard on all models of the Touran. If you want some extra help with parking your car then Volkswagen have the answer. Park Assist is available as an option on this car which helps you parallel park the car. When activated, sensors on the side of the car will identify a suitable space and steer the car into the space while you use the pedals to control the speed. There are a good range of two Petrol and four Diesel engines. One of our favourites is the 1.6 litre diesel Bluemotion (1.6 TDI 105PS) which returns over 60 mpg and gets to 60 miles per hour in 12.8 seconds. If you want more performance yet don’t want to sacrifice fuel economy the BlueMotion 2.0 TDI 140PS has a 0-60 mph time of just under 10 seconds and has a top speed of 126 mph, yet still gives you 58.9 miles to the gallon. The Petrol engines are small units but very efficient and provide good performance whilst keeping reasonable fuel economy. For instance the 1.4TSI 140PS 1.4 litre petrol engine returns 42.8 mpg whilst accelerating to 60 mph in just 9.5 seconds, with a top speed of 125 miles per hour. Very impressive for a petrol engine in a car of this size. The Touran has a good record on safety with a 5 Star Euro NCAP rating. Even the base model has anti-lock brakes and electronic stability control as standard. It also benefits from twin front, side and curtain airbags, although the airbags don’t extend to the rear row. 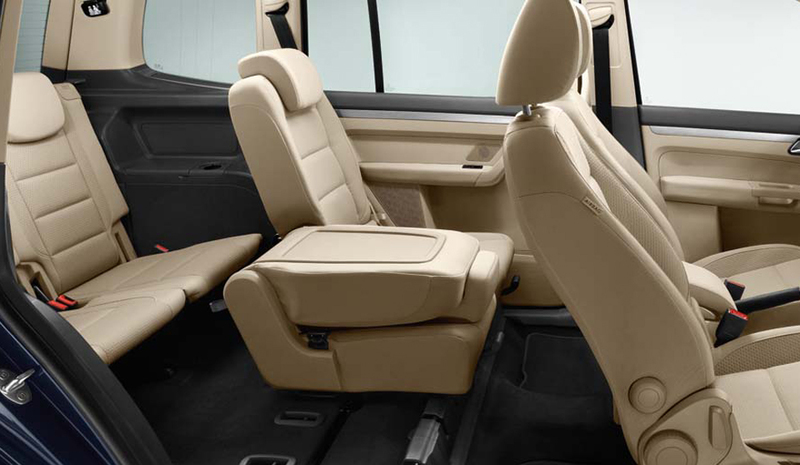 The build quality in the cabin means that the Touran should stand up well to family life. Volkswagen has always been known for it’s reliability although that has sometimes been questioned in more recent years. However the Touran fared well in the 2011 JD Power survey so expect average to good reliability for this car. With average insurance costs and excellent fuel economy and road tax costs the overall running costs for the Touran should be very good. Go for the 1.6 litre diesel BlueMotion engine and you can expect very low running costs for a seven seater car. It has a combined miles per gallon of 61.4 and with 121 g/km of CO2 Road Tax will cost just £95 per year. The BlueMotion engines are exceptional in their fuel economy and CO2 emissions but the whole range of engines on the Touran are very economical. The Touran is a worthy contender for your money when looking for a seven seater car. It has the customary Volkswagen build quality and reliability. Whilst initial prices are not the cheapest amongst rivals you do have a car that is very practical, well built and has some superb engines that deliver the required power for the car whilst giving you excellent fuel economy and low car tax.